ST. PETERSBURG, Fla. (January 8, 2018) — The Tampa Bay Rowdies opened another busy week of player transactions, announcing the signing of midfielder Lance Rozeboom on Monday. Per club and league policy, further contract details were not disclosed. 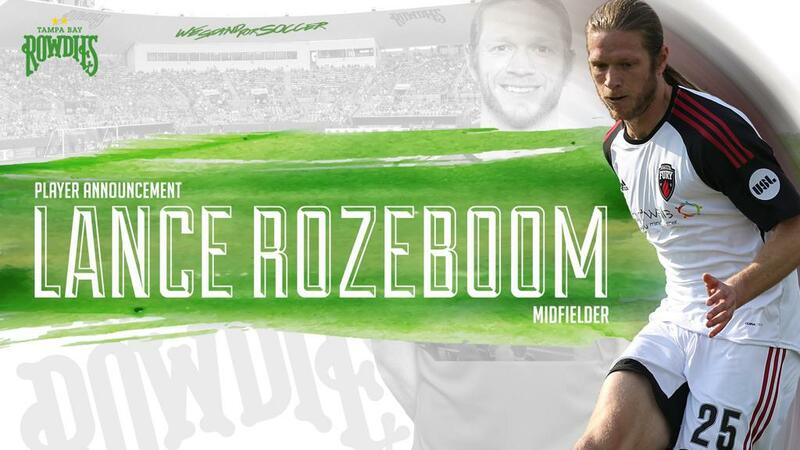 Rozeboom, 28, joins the Rowdies after spending the last two seasons with the Ottawa Fury FC. A workhorse midfielder, he has appeared in at least 21 matches in each of his five professional seasons, including 52 appearances in his two seasons in Ottawa. A respected voice and proven leader, Rozeboom served as the Fury FC’s captain. A central midfielder, Rozeboom is most comfortable in a holding role, breaking up opposition possession and providing a platform to launch attacks. He won more than 73 percent of his attempted tackles last season and intercepted 41 opposition passes. In possession, Rozeboom completed a reliable 86 percent of his passes. With five players added this week, the Rowdies now have 14 players on the roster for the 2018 United Soccer League season.